The reality is that they are both half right. It is true that the newsPAPER business is broken. But let’s be clear about what is actually broken. Newspapers were once the most efficient means for connecting private buyers and sellers (merchandise, jobs, real estate, etc.) in a defined geographic region — for decades, local newspapers’ monopoly control of this channel paid for local journalism. Then came the Internet and Craigslist, which were much more efficient for this purpose. You know this story well enough by now. It is also true that if the the professional practice of local journalism is to survive — and by this I mean people who do original reporting on a regular basis and whose work is trustworthy because it adheres to a known standard (i.e. NOT a free-for-all of citizen journalists, most of whom will never put on their shoes and socks to go out and actually REPORT, i.e. fact gathering) — then citizens of a locality are going to have to proactively value this service. BUT…it is not correct that we can expect people to pay for the news directly online. There is just too much free information, even if most of it is no substitute for the full-time work of journalists doing original fact gathering. I’m NOT saying ALL of it, because there are many bloggers who do original reporting, but the reality is that most do not, AND the standards for accuracy and fairness, while evolving, are far from clear. And let’s face it — there are limits to what the most dedicated citizen journalist can and will do without compensation in their free time without formal support. It is also incorrect that “no one knows how to fix” the news business. What the news business and the entire media business are suffering from most right now is a failure of imagination. Nobody imagined that somebody would be so recklessly uncapitalistic as to create a website where people could post classified ads for free. Nobody imagined that an online software company specializing in information retrieval, but which produced no information of its own, could create the largest market for small business advertising that the world has ever seen. We talk about creative destruction, and celebrate the rise of blogging as citizen journalism and Craigslist as self-service advertising, but there are times when something that seemed great in theory arrives in reality, and you understand the downsides. I have faith both in the future and in free markets as a way to get there, but sometimes the road is hard. If your local newspaper were to go out of business, would you miss it? What kinds of jobs that current newspapers do would go undone? ewspapers are mourning the loss of life-giving classified revenue to Craigslist. And citizens like Tim O’Reilly are mourning the anticipated loss of local newspaper journalism. And we don’t think anyone is going to pay for the news. But — what if people are still willing to pay for classified advertising? Stay with me here. We all know the problem with these options. Even notwithstanding the availability of a free online-only text ad, the inevitable conclusion is that you’re better off using Craigslist. It’s free. You can post over and over again to keep your listing current. And everyday there are more people checking Craigslist and fewer people checking the Chronicle’s classifieds. BUT…what if we introduce another factor into this equation. I’ve argued that journalism should become nonprofit, like NPR, because the reality is that the journalism we all value as citizens — the kind that brings down administrations (not that it’s done much for us lately, but that’s another story) — has never been a for-profit endeavor. It just rode along with the for-profit business. But let’s put aside the issue of profitability for a moment. The critical element in the NPR model is that it’s driven to a large degree by DONATIONS from people who value the civic service it provides. So here’s the idea (finally) — instead of asking people to donate cash or pay for news to help keep journalism alive, neither of which will fly, why not ask people to donate classified advertising. Ok, Karp’s totally lost it, you’re probably thinking. But hang in there with me. 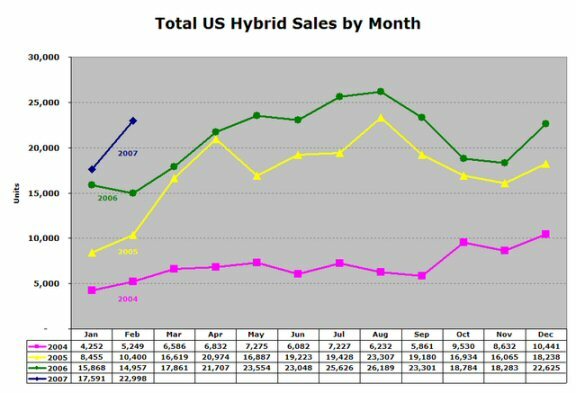 Last year I bought a Toyota Prius knowing full well that the savings on gas would take many, MANY years to pay off given the premium I paid for the Prius over a comparably equipped car. If you run the numbers based on the amount of car I got for the money, it was a completely irrational purchase. But that’s until you introduce an entirely new factor: near zero emissions. Now, I am not generally, or at least I haven’t been for most of my life, a green freak. I’m as wasteful as the next guy. But when it came time to buy a new car, I found myself starting with the previously irrational premise that I was going to pay thousands of dollars for a benefit that would not immediately accrue to me in any tangible way, like power steering. It’s important to note that I did not donate thousands of dollars to an environmental charity. I needed a car, so I bought a car. But the extra money I spent was effectively a donation to the environment (or at least that’s how I perceived it, and perceptions are all that matter for this idea). Here’s another example. Once upon a time, millions of people downloaded music for free — and illegally — from Napster and other file sharing services. Then iTunes came along and those same millions of people started paying $0.99 to get the songs legally when they could easily still get them free with no real risk of getting caught breaking the law. How completely irrational. I’ve actually gone and purchased most of the songs I downloaded from Napster back in the day. Craziness. SO, sure I can post a classified for free on Craigslist. And most people happily do so, completely oblivious to that fact that their actions are putting their local papers out of business. Most newspaper executives probably assume that people will continue to choose free Craigslist over paid listings in their paper or on their website because that is the “rational” thing for those people to do. But I wonder what would happen if newspapers introduced a new factor into the equation: the civic benefit of supporting local journalism. Imagine that you decided to post your classified listing with your local newspaper rather than with Craigslist because you knew it would support the work of local journalists who help make your locality a better place. AND, imagine, you also chose the local newspaper listing because you knew knew that your listing would be more likely to reach civic-minded people like yourself. Imagine how much more (smugly) satisfying would be to conduct your personal commerce in such a community — WAIT, there’s that word “community.” Isn’t the media revolution supposed to be all about community? Now, imagine we discover this thing called the web that has proven such a powerful platform for bringing communities together and scaling them up through the miracle of the network effect. Of course, this assumes that people can understand and appreciate the civic benefit of supporting local journalism. But the convenient truth in this case is that the civic affairs of this country — like the environment — are a sufficient mess to motivate enough people to want to do something. You never know what might happen when you just ask people to care. (Ask Gore.) The failure of newspapers to do so is not from a fear of failure, because failure seems to be the only option right now, but rather a failure of imagination. So instead of bemoaning the loss of journalism amongst themselves, newspapers should try TALKING TO THEIR READERS about it. And see what they say. It’s a “conversation,” remember? Of course, this leaves aside the issue of whether the PRINT newspaper should be allowed to survive in an age of hyper-efficient, networked online media. 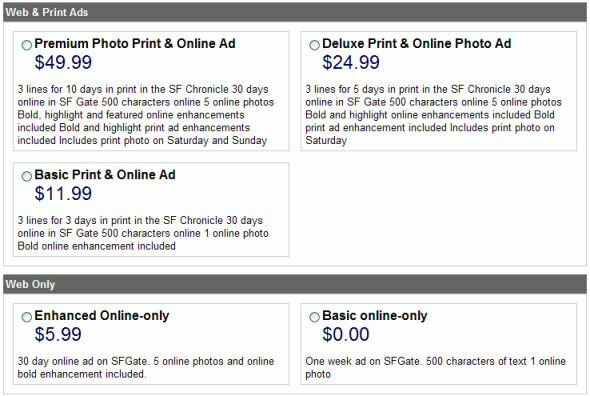 If you look at the Chronicle’s classified price list above, you can see the stark difference between the print and online pricing, which is evidence of the enormous pricing power the offline newspaper monopoly once enjoyed. Oh well. You can’t have everything.